With breathtaking views across Santa Monica Bay and the Pacific Ocean, the vintage Spanish-style Bel-Air Bay Club is an exclusive mansion estate, magnificently designed to exceed all your wildest wedding day dreams. Dating to 1927, this 31-acre property was the inspiration of Alphonzo Bell, one of Los Angeles most important developers, who conceived an estate of sublime beauty for the leisure and enjoyment of California’s growing elite. During the 1920s, 30s and 40s, the Bel-Air Bay Club was frequented by some of Southern California’s most prominent celebrities, and today its historic charms have been harnessed as one of the region’s most sought after wedding venues, combining a spectacular coastal setting on the bluffs overlooking Santa Monica Bay with unsurpassed elegance within its luxurious mansion. The estate is booked exclusively for each wedding, meaning that the staff are completely at your whim and the entire property is for you and your guests throughout your special day. 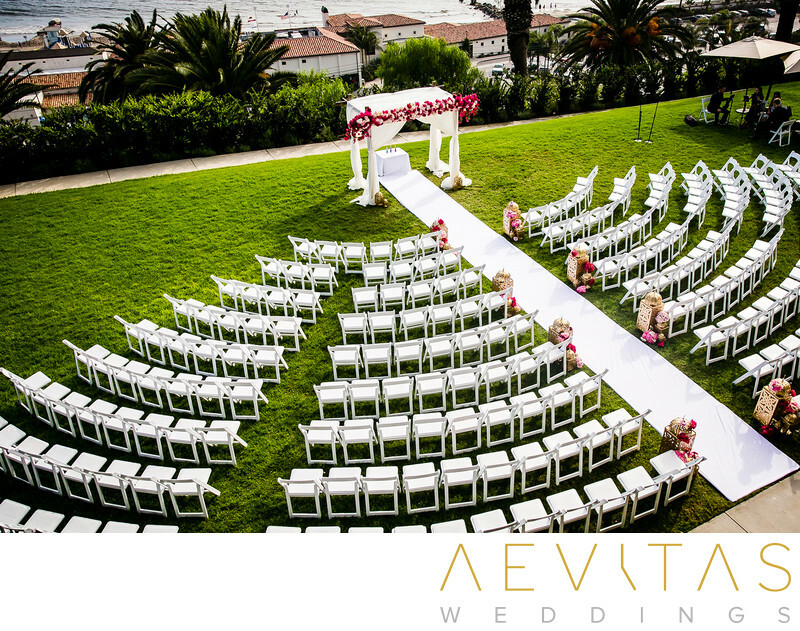 Its lush, landscaped gardens, surrounded by flower beds and backed by the Pacific Ocean, is the perfect place to exchange your vows, particularly during the late afternoon hours as the sun sinks towards the horizon. Then join your guests inside the spacious Living Room for aperitifs and nibbles, or mingle under the starry night sky in their beautifully-lit Outdoor Courtyard, complete with a flowing water fountain. The Bel-Air Bay Club’s lavish Dining Room has been designed for grand receptions, with wrought iron chandeliers, vaulted ceilings, and an impressive fireplace, while immense windows offer views across the Pacific coastline. You can dance the night away in this elegant and warm interior, then step out onto the expansive balcony to enjoy the refreshing ocean breezes. The highly experienced team at the Bel-Air Bay Club tailors each wedding to the individual couple’s dreams, with an enticing menu to choose from and an impressive attention to detail. The venue is designed for wedding parties with a minimum of 75 people and there is limited accommodation available within the Upper Clubhouse, offering stunning views over the ocean and beautifully appointed rooms.